Autosport Legends:Ayrton Senna is a tribute to the life and career of the iconic triple Formula 1 World Champion. Produced to coincide with the Senna biopic on DVD, this lavishly produced premium magazine celebrates Senna's greatest triumphs on track and his impact on the sport off it - with an absorbing mixture of archive and fresh new content. 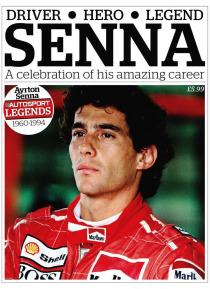 Including: Eyewitness reports of Senna’s greatest … races.  His landmark interviews with the sport’s top writers.  Technical analysis of his title‐winning racing cars.  Exclusive new features including the recollections of drivers who raced in Senna’s last GP.  Unseen photographs from award‐winning picture agency LAT Photographic.  Full career biography and statistics.